Black Panther holds number one for the fifth week, Tomb Raider has the sixth biggest opening for a video game adaptation and Justice League is the biggest loss to the DCEU. 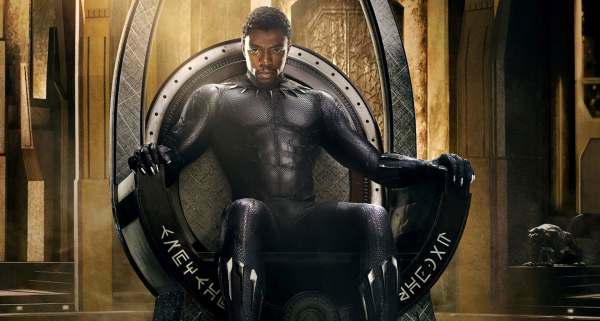 Walt Disney's Black Panther movie remained king in the top spot despite several new releases. It lost about 34% from last weekend to make $27 million for a domestic box office gross of $605 million and a worldwide total of $1.183 billion. It's now the first film to stay in the number one spot five weeks in a row since James Cameron's Avatar in 2009. Ryan Coogler's superhero flick is the seventh film to ever gross over $600 million at the domestic box office. Even more exciting, it only has to make $18 million to top Marvel's The Avengers and become the highest grossing superhero movie of all-time! This movie is still breaking records and might just break a few more in the coming weeks. Not for nothing, it pulled in $577.1 million overseas to passing Captain America: Civil War ($1.153B) and Minions ($1.159B) to become the fourteenth largest worldwide release of all-time. In related news, pre-sale tickets for Avengers: Infinity War have already broken the record set by Black Panther. Considering he's in both movies it's still a win for the king of Wakanda. Warner Bros.'s video game adaptation reboot "Tomb Raider" opened in the number two spot and made $23.5 million domestically and $126 million worldwide. This means Alicia Vikander's starring role became the sixth largest opening for a video game adaptation ever. But she couldn't beat the number one spot currently owned by Angelina Jolie's original Tomb Raider of $47.7 million back in 2001. Walt Disney's "A Wrinkle in Time" dropped to the number four spot. Ava DuVernay's lost 50% to make $16.6 million for a domestic box office gross of $61 million. and a worldwide total of $72 million. In related news, Variety reports director Ava DuVernay has come on board to direct the adaptation of the sweeping "New Gods" comic books from Jack Kirby. So Wrinkle in Time has moved her into the elite list of female directors directing superhero movies alongside Patty Jenkins. 20th Century Fox's "Red Sparrow" dropped five positions to the number nine spot but its still in the top ten. It lost about 48% since last week to make $4.5 million for a domestic box office gross of $40 million and a worldwide total of $106 million. Not too bad. Sony Pictures's "Jumanji: Welcome to the Jungle" moved two positions to the number 12 spot. It lost about 40% to make $1.7 million for a domestic box office gross of $400 million. Fox Searchlight's "The Shape of Water" moved four positions to the number 16 spot. It lost about 66% to make less than a million for a domestic box office gross of $63 million. Walt Disney's "Star Wars Episode VIII: The Last Jedi" dropped three positions to the number 24 spot to keep its domestic box office gross at $620 million and worldwide total to $1.3 billion. In other news, Zack Snyder's Justice League movie finished it's box office run with a worldwide total of $657 million and a domestic total of $229 million. That makes it the lowest grossing DCEU (DC Extended Universe) film of the franchise. What should have been the biggest movie in the series has become the smallest. Considering Justice League is rumored to be the second highest budgeted movie ever at $300 mil that's a huge loss. That might explain why Warner Bros. hasn't announced when Justice League 2 is coming out.